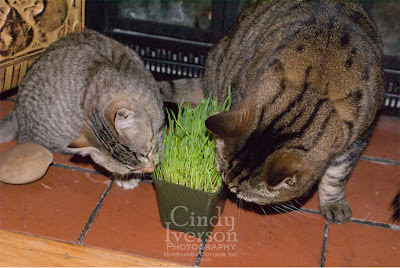 Mommy brought home a new thing that all the big kitties went crazy for as soon as she called, "Kitty grass! Kitty greens!" There was a lot of meowing. I didn't know why. So much commotion for something that didn't smell like canned food! Everyone gathered around the new stuff and chowed down. I waited until everyone else was done before I was brave enough to see what it was. 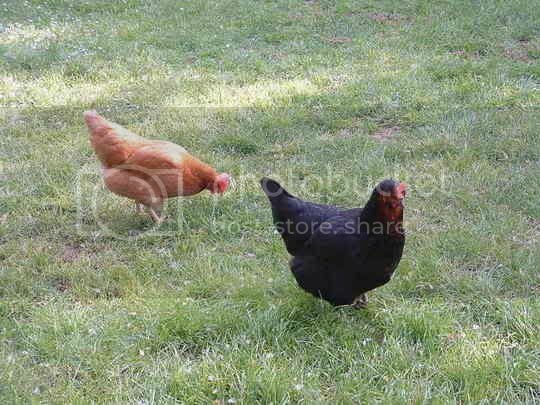 My new big friend Suzette showed me how to sniff it first. She helped me understand the importance of sniffing the dirt and all the "green-ness" first. It kinda smelled like someplace I used to be once but I can't remember where. Mommy's pant legs smell like that when she comes in the door after gardening sometimes. The smell tickled my nose a bit. Suzette said that meant it was good! 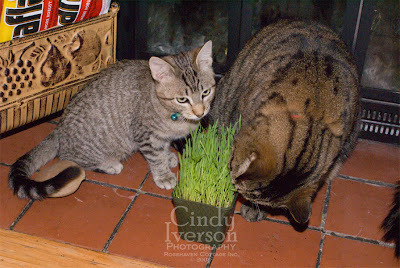 Then Suzette showed me how to nibble on the green stuff that Mommy called "kitty grass". "Bite it down at the bottom," Suzette said, "So it doesn't poke you in the nose." I'm so glad she was here to show me how. I wasn't too sure how it was going to taste. But Suzette was eating it so I decided to be brave and try it. After my first taste, I had to sit back and just think about how it tasted. Should I take another bite? I decided that I DID like it! Suzette kept watch for any danger or wild animals that might pounce on me while I really chowed down on the yummy greens. I was eating and moving so fast that I am a blur in this photo. 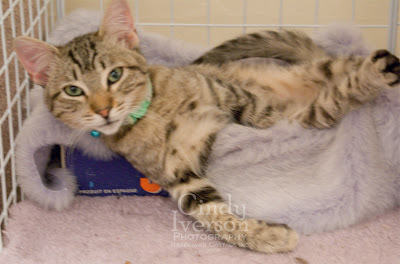 After I was all done with my first kitty grass snack, I was tuckered out. It was such an exciting adventure that I had to go sack out in my furry heated bed. Mommy! I'm tryin' to sleep here! Go away and let me dream of more kitty grass! I love this post .. people owned by cats love cat posts with a little green thrown in . The two perfect things in the world to us ! How sweet! Those kitties sure are cute. You sure had a fun grassy adventure! I wish I liked grass. You make it look so delicious! being someone who also is owned by five kitties, I find this post lovely! what beautiful fur-babies you have! The kitties at Our Little Acre are jealous because I've never brought home kitty grass for them. Must remedy that! So cute!! They really loved that didnt they? Awww so sweet. Where do I buy this. my muffin wants some. Just adorable cats, photos and story! Loved it. Hummm ... I think I need more cats. What a good story that was, Lucy Maud! 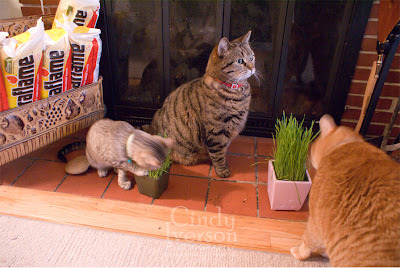 Your first munches of kitty grass - you are a lucky girl! You are a beautiful kitty! All my grand kitties love CATNIP! He liked to eat grass and catnip. Oh I love this post. I can't wait until my daughter comes home from school so I can show it to her too. Another milestone in your life Lucy Maud; the importance of eating kitty grass the proper way. And you've succeeded with flying fur errrrr colours! Well done you, Lucy! purrrrrrrrrs from the Bliss team, connaiseurs of kitty grass. SO sweet! Love the kitty grass discovery!!! Thank you so much for your sweet words to help make kari's fourtieth fun and fabulous! So adorable - loved the pictures! What a cute and creative post, Cindy! 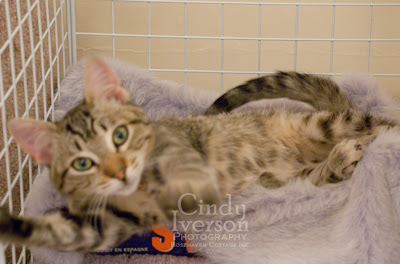 Perfect "kitty talk" to go with the photos! I guess the grass must be akin to catnip? I was away last week, after my show, visiting my father in South Carolina, so I'm late in making the rounds. Hope all is well! Too cute! I loved it. Cindy, I am so enjoying all of your garden posts. I have a long wait yet for my garden to show signs of life - so thank you for sharing yours!! I loved your post about your grandmother's poppy seeds - and how much she meant to you. I have my fingers crossed that those seeds will turn into beautiful flowers! Cute post! Love her name. By the way, tag, you're it! What alovely post Cindy!Beautiful pictures of Lucy and her gang!I must get some grass for ours as they can't go out at the moment ,we are so close to a main road and we daredn't let them out! Hi there, Lucy Maud... Kate (of 'Kate Smudges') left me a note about your blog. Well, actually it was from her dog, Lytton, who visits my 'Dog's Eye View' and with whom I've struck up a long-distance friendship. Lytton points out that we share a name, in common. The only difference is that I am hyphenated, with an 'e.' ('Lucy-Maude'). Despite that whole canine/feline distinction, I share with all your feline family, a love of tender, green shoots. Guess I'll have to wait until spring. My human can't grow kitty grass for myself or my four feline siblings, since they have access to every area and window of our tiny abode. They often munch on lettuce, which they seem to enjoy... me? Not so much. Hi Cindy, what a lovely blog you have. Your cats are really adorable!!!! Your photography is beautiful. 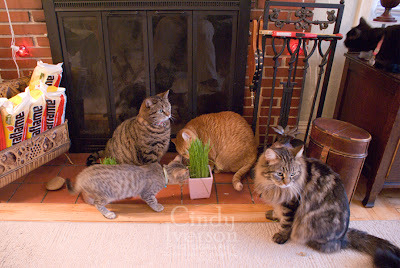 The catchildren at Sunflowerhill are glad you enjoy your catgrass, Lucy Maud. Now they want their mother to seed some more, as they plan to eat the first potfull right down to its roots! What great shots. I also have 4 cats but have not tried "kitty grass." Guess I may have to try it! Great to find your blog. Drop on over and visit me sometime! 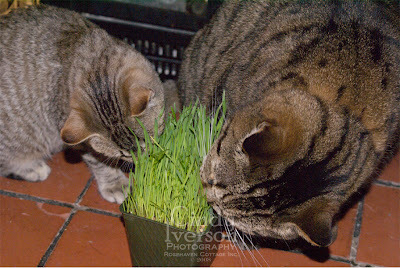 Our cat Max loves cat grass too..
You can buy grass seeds and grow the grass yourself, it is less expensive.